In the final phase of their life, stars of medium and small mass become red giants due to the expansion of their outer layers. At the same time their core starts going through a series of collapse phases that causes an increase in temperature and the fusion of helium and heavier elements up to a point that depends on their mass. When the mass is between 0.5 and 10 times the Sun’s they can pass through a phase known as the asymptotic giant branch (AGB) in which they lose a good part of their mass when their outer layers are ejected. The circumstellar envelopes formed by the mass ejected by these stars favor the formation of large amounts of dust that is projected into space just like the gas of the envelope. All these materials can be used in other newly formed star systems, including new planets. The mechanisms of stellar evolution and dust formation are not yet fully known and the Large Magellanic Cloud is the subject of a lot of research because it’s one of the dwarf galaxies closest to the Milky Way. 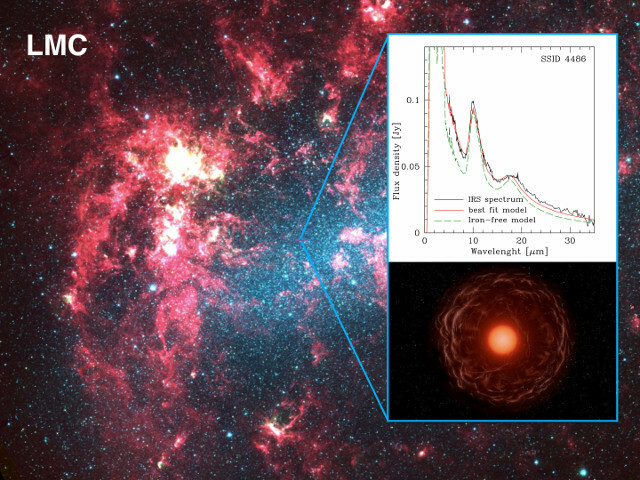 Ester Marini’s analyzed data collected using NASA’s Spitzer space telescope on stars of the Large Magellanic Cloud in their AGB phase finding infrared emissions that could not be explained by the presence of silicate dusts, which according to current models should make up the dominant type of dust in that kind of stars. The development of theoretical models has allowed to explain those emissions with the dominant presence of iron dust in stars with mass about five times the Sun’s and an age of about 100 million years. The image (Aladin-software in Spitzer colors for the Large Magellanic Cloud, JAXA for the artist’s representation of a star in its AGB phase) shows the Large Magellanic Cloud and in the box the infrared spectrum in the continuous black line of the star SSID 4486 compared with the one calculated using theoretical models of an AGB star of five solar masses in the continuous red line surrounded by materials composed of 70% iron dust. The green dotted line shows the theoretical spectrum of the same models without the presence of iron dust. Below the spectra there’s an artist’s representation of a star in its AGB phase that is ejecting materials into interstellar space. Ester Marini stressed the fact that her team characterized for the first time a class of stars with unique spectral properties. These are low-metallicity stars, which means that they have a low percentage of elements other than hydrogen and helium, in which the conditions needed for iron to become the type of dust present in the highest amounts are established. The fusion processes inside those stars in their AGB phase are so efficient that they consume most of the magnesium and the odygen on their surface so silicates that generally form the outer layer can’t be formed. Paolo Ventura of the Italian National Institute of Astrophysics, one of the authors of this research, explained that it’s the first time that a theoretical explanation is given for the presence of iron dust. The group he coordinated collaborates with the Instituto de Astrofísica de Canarias (IAC) to study the impact that the gas and dust released by AGB stars have on the interstellar medium. This research offers a solution to the mystery of the presence of iron dust around stars in their AGB phase. It’s one of the many that will take advantage of the observations that will be conducted with the James Webb space telescope when it’s finally launched, according to the current schdule in 2021, since it will allow to observe many more stars in their AGB phase in various galaxies.